Create a beautiful focal point in any room. Easy to insert in the wall. Three vibrant, adjustable flame colors, five flame intensity settings and adjustable heat. Touchstone's Sideline® 60 inch wall-mounted, electric fireplace is the big brother to Touchstone's popular 50-inch Sideline®. As with all Touchstone™ products, The Sideline® 60 was developed using feedback from our customers, specifically contractors, and installers. This larger format fireplace features a ventless design, with the adjustable heat coming from the vent on the face of the fireplace. Of course, The Sideline® 60 features Touchstone's amazingly realistic flame, which will leave your guests wondering if this is a real gas log. 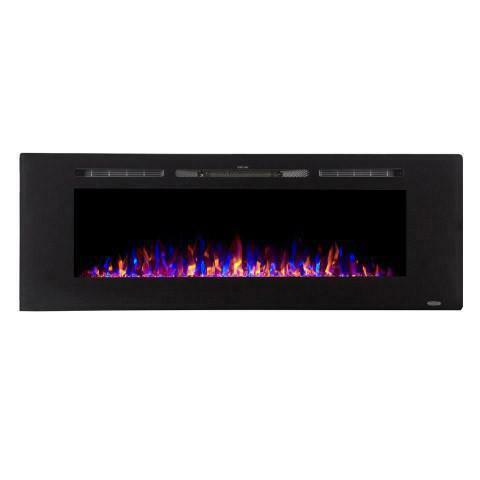 The Sideline® 60 has a large black glass frame around the realistic flame, and it fills a wall with a really great design. You get the great look of a wall-length electric fireplace, without the mess and smell. The Sideline® 60 has 5 flame settings and 2 heat settings, and the fireplace can be operated without the heat, so no need to wait for a chilly night to turn it on. All your mounting hardware is included, and Touchstone™ support is just a phone call, email or live chat away, in case you need help. The heart of Touchstone's electric fireplaces is our exclusive, realistic flame. This flame set is so natural-looking, your friends will be nervous to touch the glass. The Sideline® 60 gives you 5 flame settings, from a romantic ember to a full blaze, all of which can be controlled from the remote or from the control panel on the face of the fireplace. Read more about the benefits of electric fireplaces. You may be asking, does this thing actually throw off heat? Why yes, it does. The Sideline® 60 can help heat a room up to 400 square feet, with a heater that delivers 5100 BTUs. It's perfect for taking the edge off a cool evening in the fall, or for giving your room a little more cozy warmth on a frosty winter night. 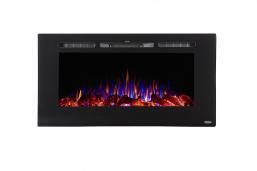 Of course, The Sideline® 60 can also be operated without the heat on, but with the full fireplace operational. It's your choice and The Sideline® 60 wall-mounted fireplace makes it easy. The Sideline® 60 electric is designed for recessed placement in your wall, but it can be hung on the wall as well. 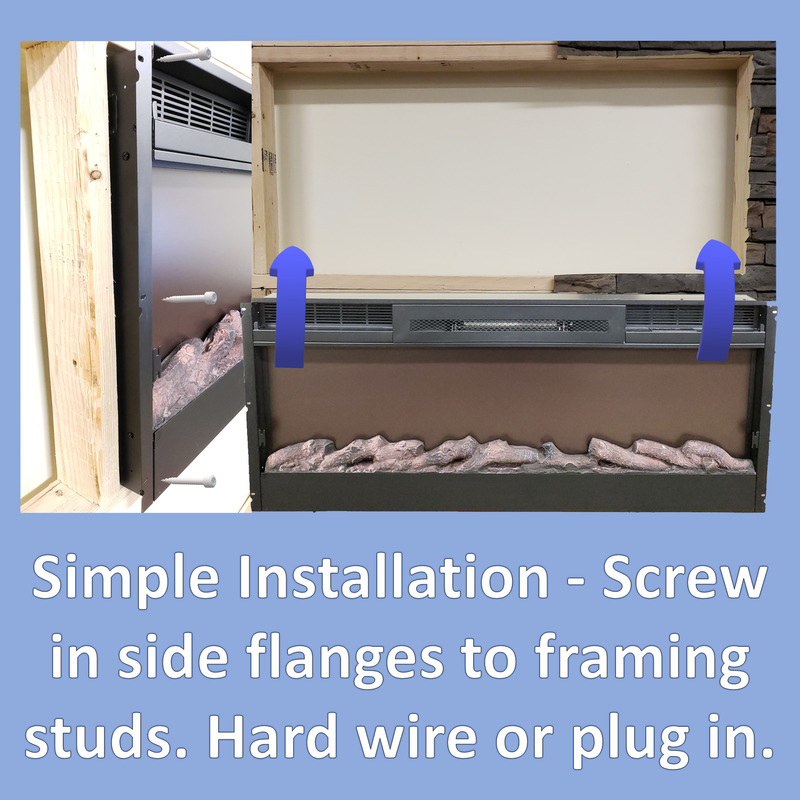 Instructions for mounting and install come with the fireplace, and we recommend you follow the simple instructions provided. We do recommend placing The Sideline® 60 at least 20" below your ceiling or 12" below your mounted flat screen because of its heating feature.